Coco is 15+ years old. You can feel his bones through his fur, as his muscles have become more lax. He was never very vocal until our other cat passed away a few years ago. Now, he squawks, he chirps and his meows range from croons to peeps. He's still a timid cat, though ever curious. If I haven't already done so, I recommend having a cat in the house at all times, they're good company. Every house needs a cat...and every cat should have a house! Or at least a home. Coco looks like a kitten....a beautiful portrait Diane! Absolutely! I can't imagine painting without a FSC--feline studio companion. What a handsome boy--I can see why he inspires you to paint so many beautiful paintings! Another BEAUTIFUL portrait! 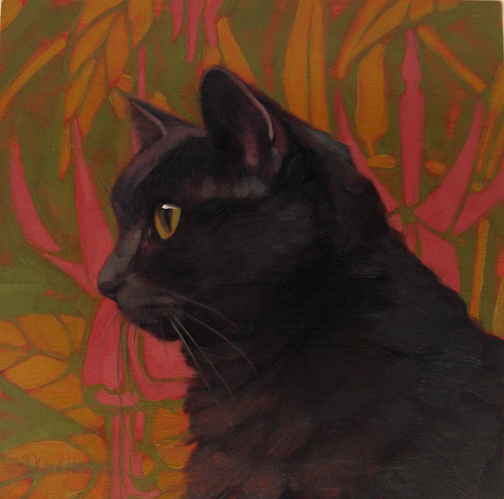 I love your stories about your cats--your reverence shows in your paintings. Our home has never been without a cat or two or three, LOL, ferals (tamed) in recent years. And I really love meeting other people and artists who bond immensely with felines! We're working in Stockton Ca to reduce homeless/abandoned pet populations. It is traumatic, but the success stories keep us going. Your paintings convey the bond even with owner absent from the image! Astounding! Beautiful portrait! 15 + years! That's great. I'm sorry for the loss of your alpha girl, but glad Coco has had a chance to find his voice.